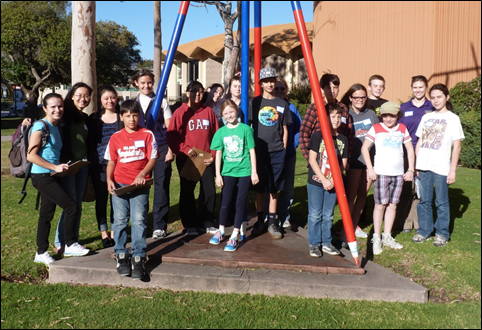 Get Your Students Involved in the My California GIS Mapping Exhibition and Competition! With registration for the competition now closed, the CGA is happy to report that 29 schools have registered for the competition. That could mean as many as 145 student entries in the state final! An illustrious panel of eleven judges has stepped forward to evaluate and rank the student entries, so we are all set for an exciting competition. Thank you to all of our volunteer judges! Click here to see a map of schools registered for the competition. 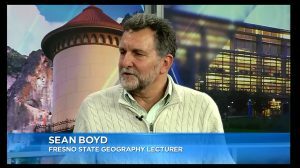 The California Geographic Alliance is hosting an exciting statewide mapping showcase and competition that encourages middle (4th-8th grade) and high school (9th-12th grade) students to harness the power of Geographic Information Systems and get connected with their state by producing an online map that focuses on stories, issues, or ideas that are important to them. Registrations due March 15, 2017! Go to the contest page for full details. 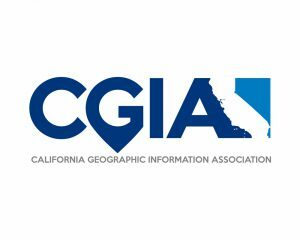 Thanks to the Northern California URISA Chapter and the California Geographic Information Association for their generous support of this effort! 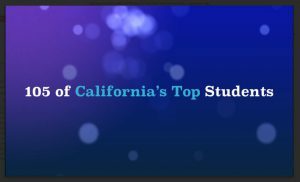 Planning on attending the California Council for the Social Studies Conference in Sacramento, March 3-5? The CGA is proud to be a Silver Sponsor of the conference, and we are even more excited to be sponsoring an amazing array of sessions and workshops. Come visit the booth in the exhibit hall to learn about the latest resources and see some incredible maps, and please check out these great sessions. Session: Human Geography with a Global Studies Lens…for Everyone! Sweetwater Union High School District curriculum specialists will present the new Human Geography course for all ninth graders in the district. Goals of the course, district-wide implementation and training, instructional guides, & formative assessments will be examined. Come find out what 21st Century geography is all about and how to implement it at the district and classroom level. Session: Beyond 13: The enduring legacy of North America’s Spanish colonies. This session offers a counter-narrative to “British centric” U.S. history that is taught as a progression of people and ideas that move from east to west across the continent. Spanish colonization, especially efforts to settle California, will be considered. Influences on America culture that progressed north from Mexico to the U.S. will be presented through inquiry-based teaching resources. This workshop will introduce K-12 educators to the National Geographic Teacher Certification Program. By attending, you will complete Phase1 of the process, and you will learn the steps through which you can become certified and become part of an exciting and rapidly growing educator community and get preferred access to unique opportunities, such as connecting your classroom to National Geographic explorers. 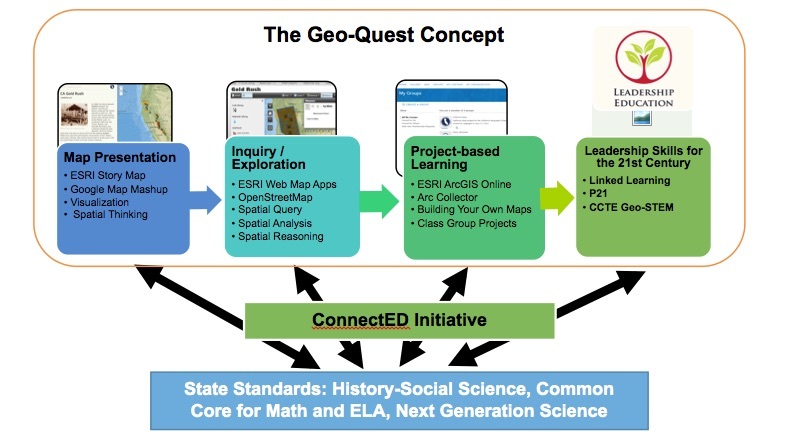 Geo-Quest is an initiative of the California Geographic Alliance that provides students at all grade levels with the tools and scaffolding needed for in-depth learning and critical thinking. By examining topics from all social studies disciplines in geographic context, students become active, geo-literate, and knowledgeable citizens who can develop solutions to contemporary problems and succeed in college, career and civic life. This session will introduce teachers to the California Geographic Alliance’s brand new Giant Traveling Map and a set of engaging, standards-based learning activities for third and fourth grades. What is contemporary geography and global competence? What are the most effective and engaging ways to teach these standards-based concepts and skills? Teacher Leaders in the Sacramento region are engaged in a year-long professional inquiry project to explore and implement answers to these questions. Come learn about our project findings and share your insights and experiences with project leaders. Make use of free web-based technology to have students interact and create geospatial presentations of data. Attendees will learn how to access ArcGIS Online for themselves and their school, learn about existing lessons, and how using spatial thinking can enhance the relevance and experience of data and mapping projects in the classroom. California Giant Traveling Map Available for 2017! The Network of Alliances for Geographic Education has an exciting new national initiative for 2017: the State Giant Traveling Map Program. 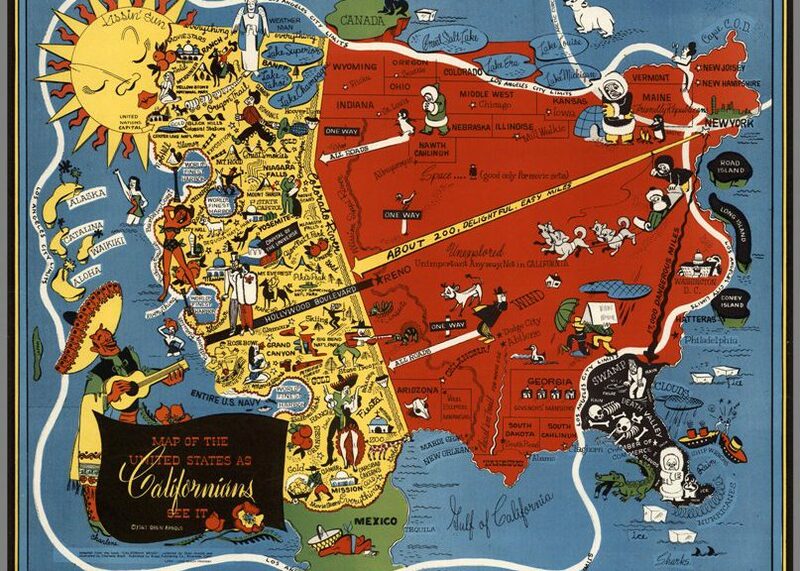 At least two giant maps of California (17 x 21 feet, so not as large as the giant continent maps) will be circulating the state beginning in January. The maps are specifically designed for use by 3rd and 4th grade students, and they come with lesson plans designed by National Geographic and tied to standards for those grades. 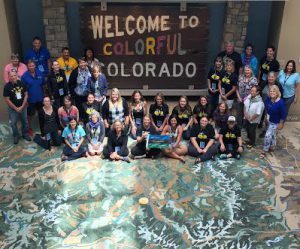 Three teachers from California went to Denver, Colorado this past summer to receive training from National Geographic staff. They have also developed lesson plans specific to our state standards, which they have begun piloting with teachers and students. The CGA wants to thank Stephanie Buttell-Maxin, Mandi Marcus, and Josh Bess for their support of the National Initiative in California. We will all benefit from their thoughtful leadership. Interested in getting the California Giant Traveling Map to your school? Click on this link to provide your name, school details, and contact info: https://www.surveymonkey.com/r/6WJM6HP and someone will be in touch with you soon. GEEO Helps Educators Make International Travel Part of Professional Development! 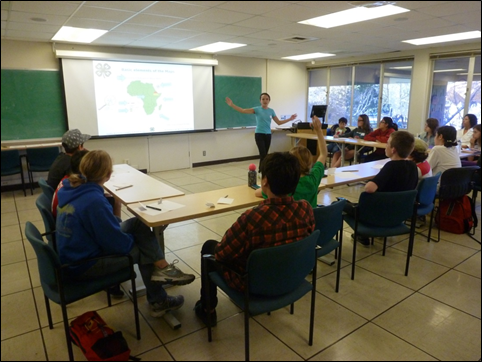 At the CGA, we see geographic knowledge and skills and global citizenship as intertwined and mutually supportive. Therefore, we encourage educators to use travel as part of an individualized professional development strategy. We are happy to share the following information from GEEO, a unique non-profit organization designed to serve educators and offering a fabulous range of travel experiences at reasonable cost. will talk about these trips all year in my classes. For so many of my students, my description of my travels will be the only exposure they will have to other countries and other ways of life.” -Teacher Michael Baldwin, who’s first time traveling abroad was with GEEO. Travel the world, earn professional development credit, and bring global understanding into your classroom! Founded in 2007, Global Exploration for Educators Organization (GEEO) is a 501c3 non-profit organization that has sent over 1600 teachers abroad on adventurous travel programs. With GEEO educators can earn professional development credits and optional graduate credit while seeing the world. GEEO’s trips are 7 to 21 days in length and are designed and discounted to be interesting and affordable for teachers. In addition to amazing tour leaders, many of the programs are accompanied by university faculty that are experts on the destination. GEEO also provides teachers educational materials and the structure to help them bring their experiences into the classroom. The trips are open to all nationalities of K-12 and university educators, administrators, retired educators, as well as educators’ guests. The deposit is $250 for each program and then the final payment is due 60 days before departure. GEEO is offering the following travel programs for 2017: Bali/Lombok, Bangkok to Hanoi, China, Costa Rica, Eastern Europe, The Galapagos Islands, Greece, Iceland, India/Nepal, Bhutan, Ireland, Armenia/Georgia, Italy, Multi-Stan, Antarctica, Morocco, Myanmar (Burma), Peruvian Amazon, Peruvian Andes, Southern Africa, Vietnam/Cambodia, Balkans and, a Mt. Kilimanjaro climb. Detailed information about each trip, including itineraries, costs, travel dates, and more can be found at www.geeo.org. GEEO can be reached 7 days a week, toll-free at 1-877-600-0105 between 9 AM-9 PM EST. Leather craft, archery, and sheep showmanship were activities I pursued as a youth member of the All-American 4-H Club of Fort Collins, Colorado. Rooted in an agrarian past, the youth development organization 4-H has since expanded its focus to include the STEM disciplines—science, technology, engineering, and math—in its mission to foster leadership, citizenship and life skills in children. 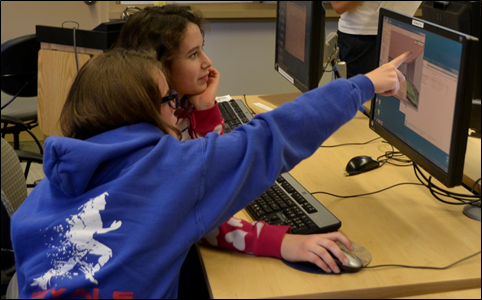 “Maps and Apps” was the national 4-H science theme of 2013, recognizing that geospatial technology and reasoning skills are essential to many of today’s careers and approaches to solving problems. 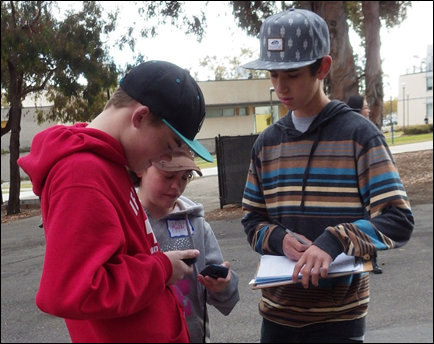 To align with the “Maps and Apps” theme, members of UC Santa Barbara Geography’s Outreach Committee and the Center for Spatial Studies developed and delivered the workshop Building a UCSB Scavenger Hunt. 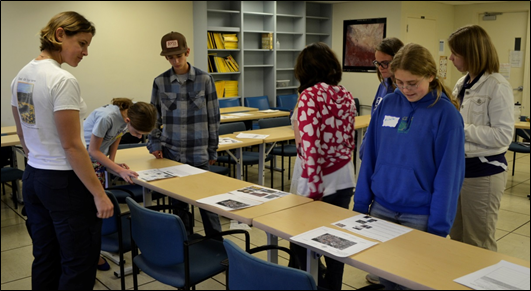 Following the 4-H “learn by doing” approach, the workshop was designed to teach participants how to read and navigate with a map, use a GPS receiver to collect geospatial data, and visualize their data using Google Earth. 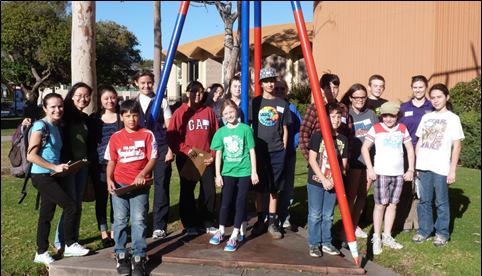 Approximately thirteen 4-H members ages 9–16 participated in the workshop, which was held on three consecutive Saturdays on the UCSB campus. Each day had a different focus, beginning with basic map reading and culminating in the final project—a scavenger hunt, designed and created by the participants, themselves. On Day 1, participants followed self-guided tours adapted from UCSB’s Interactive Campus Map (http://map.geog.ucsb.edu/). Day 2 was devoted to data collection, where participants selected and navigated to different locations on campus; recorded their latitude–longitude coordinates using a GPS receiver; devised trivia questions; and shot descriptive photographs. Participants synthesized their data on Day 3, when they were tasked to design their own scavenger hunt in pairs. Each pair developed their own design that included a map created in Google Earth, trivia questions, and photos, all assembled on two letter-sized pages. Post-workshop feedback from the participants was positive. The highlight of each day was the activity session (i.e., map navigation, collecting data, and producing paper scavenger hunts), but from a teacher’s perspective, the discussion, presentations and individual writing time helped participants realize that they were learning skills in addition to having fun. An important component of the workshop was the paper scavenger hunt that each participant brought home on Day 3, which they could share with their families and friends as a product of their own making. One challenge that we anticipated was the range in age (9–16) of the participants. We designed the workshop to require no prior knowledge of the material, but inevitably participants arrived with different levels of competence. The age range turned out not to be a problem, however. As members of the same 4-H club, the participants all knew each other, and the older participants were used to mentoring the younger ones. If this workshop were to be delivered to a group of participants who were not as comfortable working together, however, such a difference in ages might pose a greater challenge. Following are guidelines, templates, and our “lessons learned” for anyone wishing to adapt and offer a similar activity. More complete information about each day’s activities, along with a comprehensive materials list, can be found in the included example files, noted in red. Four graduate students developed and led the workshop, which was attended by 6–13 participants each day. On days 1 and 2 an additional one or two adults assisted with the outside activity. Each day was allotted three hours and consisted of (a) an introduction to the day’s topic, given by the leaders; (b) a hands-on activity, where the participants practiced a skill; and (c) reflection and writing about the day’s activities. The structure was partly dictated by the 4-H program’s emphasis on presentation and record-keeping skills. Our total budget was approximately $150, the majority of which was used to purchase four secondhand digital cameras and storage media. We borrowed GPS receivers for the activity at no cost from the Department of Geography. > Use existing campus maps & tours as resources when possible (e.g., for Day 1 map-reading activity). > Be ready with an activity for the start of each day to occupy participants who come early; inevitably, some participants will arrive late. > Have on hand participants’ parent/guardian contact information and relevant medical history/needs. > Be prepared for fluctuation in attendance, and ensure that your plan is flexible enough to accommodate participants who miss a day. Figure 6. Three distinct approaches to scavenger hunt design.